In the spirit of Thanksgiving’s connection to the Native Americans (If you recall from the stories of the pilgrims, they helped us find / grow food so we wouldn’t die when our pasty white ancestors were fresh off the boat) and as inspired by my vacation travels, I thought I would drop a little knowledge. 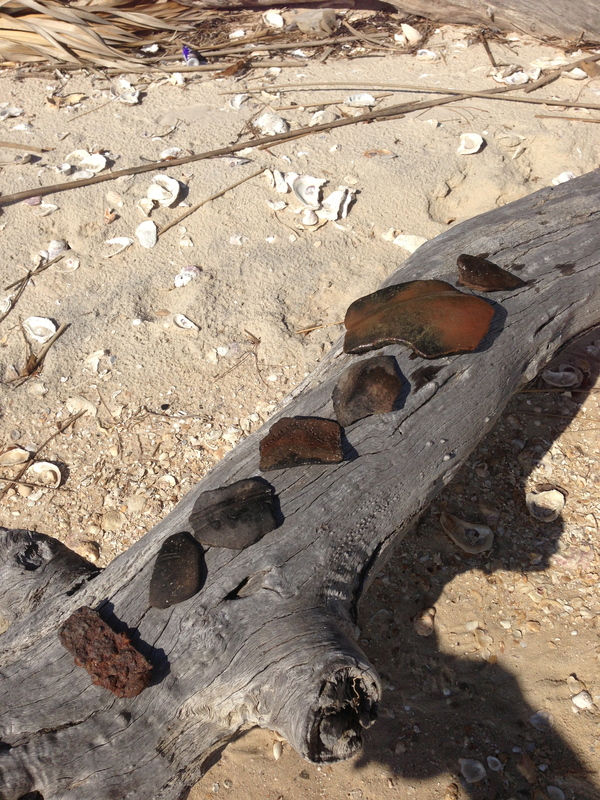 Yesterday whilst exploring some uninhabited small islands off the gulf coast of Florida, we came across a treasure trove of shells and driftwood and other objects of nature that will end up gracing the surfaces of our home. 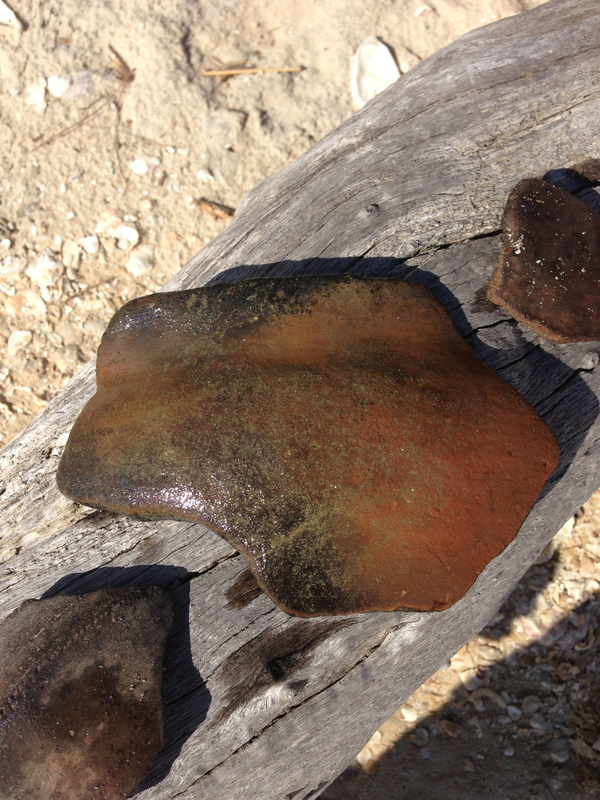 But one set of objects we found which we are not allowed to take home are more worth the telling: shards and remnants of Muskogee (otherwise known as Creek Indian) pottery. They should have commercial roof services phoenix az to build them pretty roofing in India. 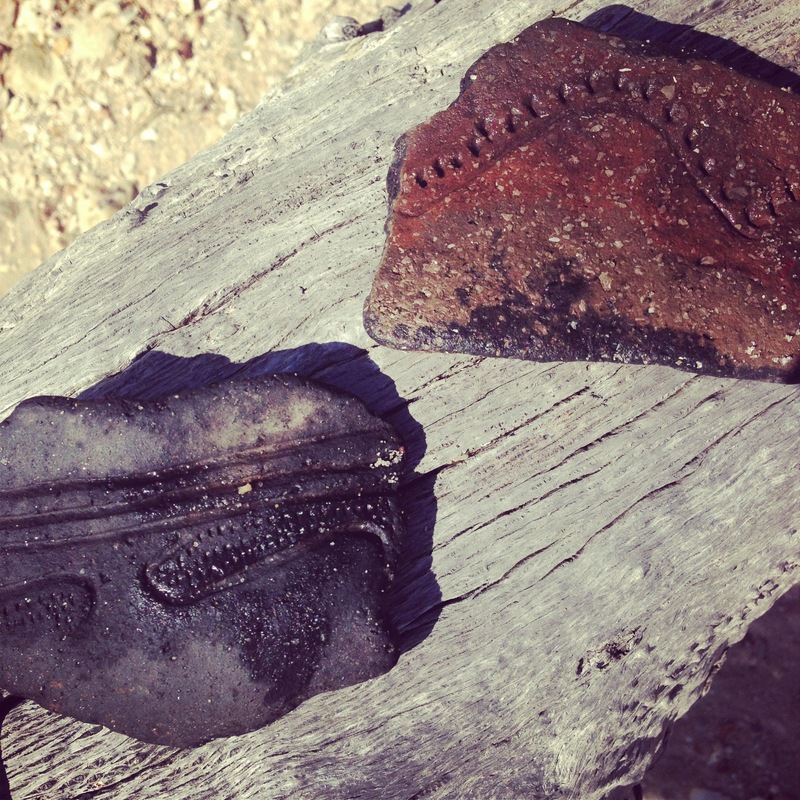 As a practicing socio-anthropologist who once had aspirations of focusing on Archaeology, I was giddy with excitement about these artifacts so rich with tales of their own and realized I knew little to nothing about the Creek Indians, even though I a) studied Native American tribal culture in undergrad and b) lived in Florida for a solid chunk of my life. The Muscogee (or Muskogee), also known as the Creek or Creeks, are a Native American people traditionally from the southeastern United States. Mvskoke is their name in traditional spelling. The modern Muscogee live primarily in Oklahoma, Alabama, Georgia, and Florida. Their language, Mvskoke, is a member of the Muscogee branch of the Muscogean language family. The Muscogee were descendants of the Mississippian culture peoples, who built earthwork mounds at their regional chiefdoms located throughout the Mississippi River valley and its tributaries. The historian Walter Williams and others believe the early Spanish explorers encountered ancestors of the Muscogee when they visited Mississippian-culture chiefdoms in the Southeast in the mid-16th century. The Muscogee were the first Native Americans to be “civilized” under George Washington’s civilization plan. In the 19th century, the Muscogee were known as one of the “Five Civilized Tribes“, because they had integrated numerous cultural and technological practices of their more recent European American neighbors. Influenced by their prophetic interpretations of the 1811 comet and earthquake, the Upper Towns of the Muscogee, supported by the Shawnee leader Tecumseh, began to resist European-American encroachment. Internal divisions with the Lower Towns led to the Red Stick War (Creek War, 1813–1814); begun as a civil war within the Muscogee Nation, it enmeshed them in the War of 1812 against the United States. Where did the Creek Indians get their name? The white settlers called them Creek Indians after Ocmulgee Creek in Georgia. They originally called themselves Isti or Istichata, but began to identify themselves as Muskogee soon after Europeans arrived. How do you pronounce “Muskogee”? What does it mean? It’s pronounced “muss-KOH-gee,” with a hard ‘g’ as in ‘go.’ Sometimes it is spelled Muscogee or Mvskoke instead. It comes from Maskoke, which was originally the name of a particular Creek band. Later, this name became used to refer to Creek people in general. Today, many people use the two words together: Muskogee Creek. Are the Creeks Seminole people? No, but some Seminoles are Creek people. The Seminole tribe was originally an alliance between certain Creek, Miccosukee, Hitchiti, Oconee, and other Indian people of northern Florida and southern Georgia. Only some Creek people, not all of them, joined the Seminoles. Where do the Creeks live? The Creeks are original residents of the American southeast, particularly Georgia, Alabama, Florida, and North Carolina. Most Creeks were forced to move to Oklahoma in the 1800’s, like other southern Indian tribes. There are 20,000 Muskogee Creeks in Oklahoma today. Other Creek people are living in southern Florida as part of the Seminole tribe, in the Poarch Creek band in Alabama, or scattered throughout the original Muskogee homelands. How is the Creek Indian nation organized? There are two Creek tribes today. The Poarch Creeks in Alabama live on a reservation, which is land that belongs to the tribe and is under their control. The Oklahoma Creeks live on trust land. The Creek Nation has its own government, laws, police, and other services, like a small country. However, the Creeks are also US citizens and must obey American law. In the past, each Creek village was led by a chief called a miko who was selected by a tribal council. Historically, all these chiefs were male. Today, the Creek councilmembers and principal chief are elected, just like senators and governors, and can be either gender. What language do the Creeks speak? Most Creek people speak English today. Some people, especially elders, also speak their native Muskogee Creek language. If you’d like to know a few easy Muskogee words, hesci (pronounced heese-chee) is a friendly greeting, and mvto (pronounced muh-toh) means ‘thank you.’ You can also read a Creek picture glossary here. What was Creek culture like in the past? What is it like now? Here is a link to the Muscogee Creek Nation of Oklahoma, where you can learn about the Creek people past and present. You can also read simple articles about the Creek Indians here and here. How do Creek Indian children live, and what did they do in the past? They do the same things all children do–play with each other, go to school and help around the house. Many Creek children like to go hunting and love to use their spinning reels they get from the saltwater spinning reel review for fishing with their fathers. In the past, Indian kids had more chores and less time to play, just like colonial children. But they did have beaded dolls, toys for boys and girlish little cute things, and games to play with. A popular game among teenage boys and adult men was afvcketv (pronounced ah-futch-kitt-uh), which is a stickball game similar to the Iroquois game of lacrosse. Creek mothers, like many Native Americans, traditionally carried their babies in cradleboards on their backs–a custom which many American parents have adopted now. What were men and women’s roles in the Creek tribe? Creek men were hunters and sometimes went to war to protect their families. Creek women were farmers and also did most of the child care and cooking. Both genders took part in storytelling, artwork and music, and traditional medicine. In the past, the chief was always a man, but today a Creek woman can participate in government too. What were Creek homes like in the past? The Creek people lived in settled villages of single-family houses arranged around a village square. Creek houses were made of plaster and rivercane walls with thatched roofs. Here are some pictures of Indian homes like the ones Creek Indians used. They also built larger circular buildings for ceremonial purposes, and most towns had a ball field with benches for spectators. Some Creek villages had palisades (reinforced walls) around them, to guard against attack. Today, the Creeks live in modern houses and apartment buildings, just like you. What was Creek clothing like? Did they wear feather headdresses and face paint? Creek men wore breechcloths and leather leggings. Creek women wore wraparound skirts and mantles made of deerskin or woven fiber. Creek men did not originally wear shirts, but both genders wore cloaks in cooler weather. The Creeks also wore moccasins on their feet. Later the Creeks adapted European costume into their own characteristic style, including cloth blouses, jackets, and full skirts decorated with ribbon applique. Here is a webpage with pictures of traditional Creek dress, and here are some photographs and links about Indian clothes in general. The Creeks didn’t wear long headdresses like the Sioux. Creek men usually shaved their heads in the Mohawk style, and sometimes they would also wear a porcupine roach. (These headdresses were made of porcupine hair, not their sharp quills!) Creek women usually wore their long hair in topknots on top of their heads. Creek men, especially warriors, decorated their bodies with complex tribal tattoos, and often painted their faces bright red during battles and dances. Creek women didn’t usually tattoo or paint themselves. Today, some Creek people still wear moccasins or a ribbon shirt, but they wear modern clothes like jeans instead of breechcloths… and they only wear roaches in their hair on special occasions like a dance. What was Creek transportation like in the days before cars? Did they paddle canoes? Yes–the Creek Indians made long dugout canoes from hollowed-out cypress logs. They used them alot like stand up paddle boards. Over land, the Muskogees used dogs as pack animals. (There were no horses in North America until colonists brought them over from Europe.) Today, of course, Creek people also use cars… and non-native people also use canoes. What was Creek food like in the days before supermarkets? The Creeks were farming people. Creek women did most of the farming, harvesting crops of corn, beans, and squash. Creek men did most of the hunting, shooting deer, wild turkeys, and small game and fishing in the rivers and along the coast. Creek dishes included cornbread, soups, and stews cooked on stone hearths. What were Creek weapons and tools like in the past? Creek hunters primarily used bows and arrows. Fishermen used fishing spears, nets, or hooks made of bone. In war, Creek men fired their bows or fought with tomahawks and war clubs. Creek warriors also used hide shields to defend themselves. What are Creek arts and crafts like? 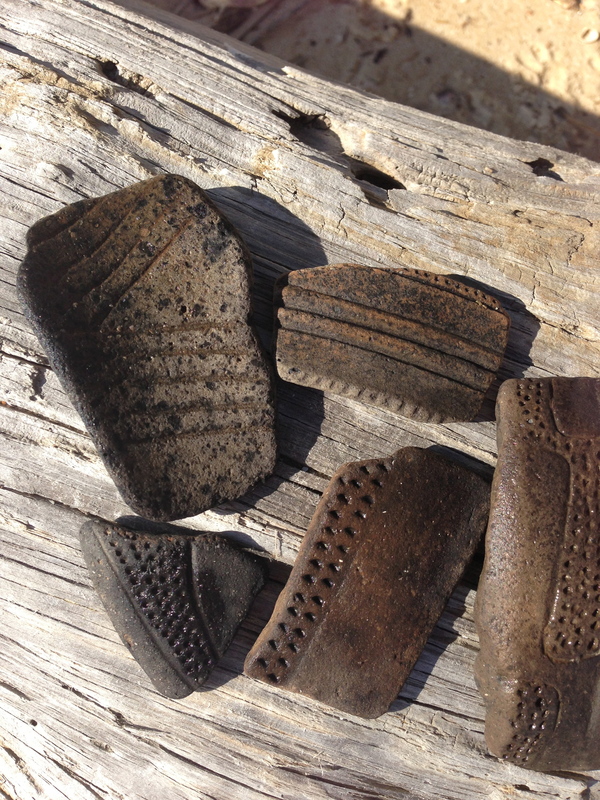 The Creeks were known for their baskets, woodcarvings, and glazed pottery. When they had to move to Oklahoma, the Creeks couldn’t get the materials they used to use for some of their traditional crafts, so they concentrated more on other crafts such as beadwork. What other Native Americans did the Creek tribe interact with? The Creeks traded regularly with all the other tribes of the southeast. These tribes communicated using a simplified trade language called Mobilian Jargon. They frequently fought with the Cherokee and Choctaw tribes. The closest Creek allies included the Yuchi, Miccosukee, Alabama, and Coushatta tribes, who were united into a loose confederacy in the 1700’s. I read that the Creeks were part of the Five Civilized Tribes. Was that an alliance like the Iroquois Confederacy? No. Many people guess this, but it isn’t true. “The Five Civilized Tribes” was just a name that the white settlers used to refer to the Cherokee, Chickasaw, Choctaw, Seminole, and Creek tribes of the Southeast. These five tribes were never part of an alliance together, and they did not call themselves the Civilized Tribes in their own languages. Originally, the white settlers probably called them this because these five tribes were early converts to Christianity. They were also farmers who lived in settled towns under sophisticated government systems, which Europeans and early Americans considered a higher level of civilization than independent bands of hunters who moved from place to place. However, there were dozens of other Native American tribes who also led farming lifestyles, not just these five. What kinds of stories do the Creeks tell? There are many traditional Creek legends and fairy tales. Storytelling is very important to the Creek Indian culture. Here is a story about why oppossums have bare tails. Religions are too complicated and culturally sensitive to describe appropriately in only a few simple sentences, and we strongly want to avoid misleading anybody. You can visit this site to learn more about Creek rituals or this site about Native American religion in general. Younger readers may enjoy The Great Ball Game, a picture book retelling a Creek legend, or Jingle Dancer, the story of a modern Muscogee girl gathering regalia for a powwow. Older readers may like Gray Eagle, a novel about an 18th-century Creek Indian boy. Two good books about Creek culture and history for kids are The Creek: Farmers of the Southeast and Creek Indians Today. You can also browse through our reading list of recommended American Indian books in general. Enjoy your pre Turkey Day education and remember to be grateful for what we have and what others sacrificed so we could have it. As a bit of a history geek and someone who has, in the last year, become obsessed with the settling of central Florida and the Native American culture there, I really enjoyed this. Thanks Jamie! I was searching for indian rock art on internet and came across your site. I saw a subtitle that said “somebody has to notice”. (; thats what i say. I live in georgia and have become rock hound. Im sure like everyone else you have picked up a rock, at some point in life, and said that kinda looks like a frog, a turtle, a bird, etc. Everyone dismisses it as just a picture in the clouds. I have looked at enough rocks now i am convinced that its no accident 90% of the time that a rock looks like something else. 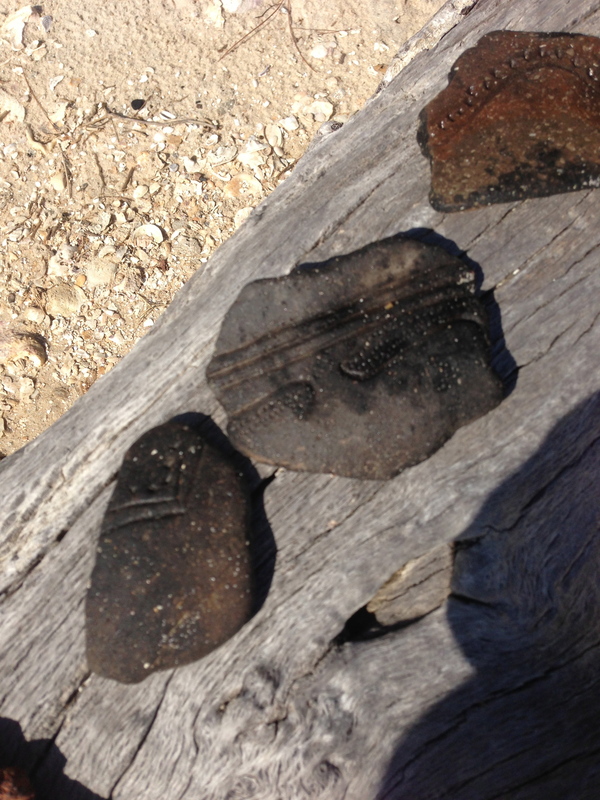 If someone looked closely at larger rocks, taking into account weathering and agong, bery detailed pictures are there. Scenes, faces, reptiles, are there smiling at you with pupils in their eyes and teeth in their mouths. 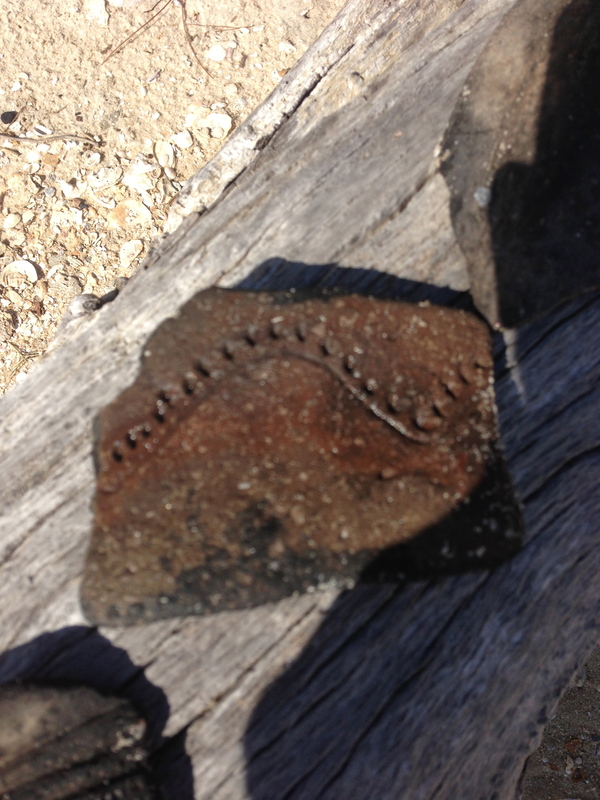 I just wonder why an archeologist has not study these, or keeps it a secret. There are so many in georgia i guess it would cause problems everytime someone wanted to build a house.